Controlling a project is pretty demanding: The planner has to take into account not only resource allocations, but also resource costs and consumption (actual vs. plan), item consumption, project booking principles (percentage of completion method with its multiple variants) etc. The NAV Jobs module meets this highly complex challenges by bringing together data from different NAV modules. The initial outcome is a list of projects (the Jobs list) providing a high-level overview of the projects and some key financial indicators. 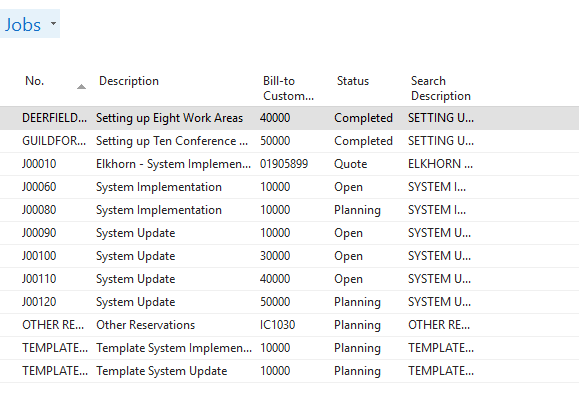 The list shown above vividly indicates the financial focus of the Jobs module as it does not provide any planning and scheduling related information such as timeframes, milestones and timeliness of projects, not even when drilling down into one project by viewing and editing JobTasks and Job Planning Lines. The Job Tasks provide the general structure of the project's sub tasks, defining the hierarchy of the project’s tasks. And although they also provide time-related information such as task start and finish date there’s no opportunity given of properly scheduling by way of creating and working with dependencies between job tasks such as start/start, start/finish, finish/start and finish/finish relations. This, of course, also means that there will be no automatically updating of dependent tasks if one task has been changed. This has to be done manually. The function of the Job Planning Lines basically lies in the allocation of resources to a job task, this being an important aspect of project management as it affects the "delivery side" of a project. 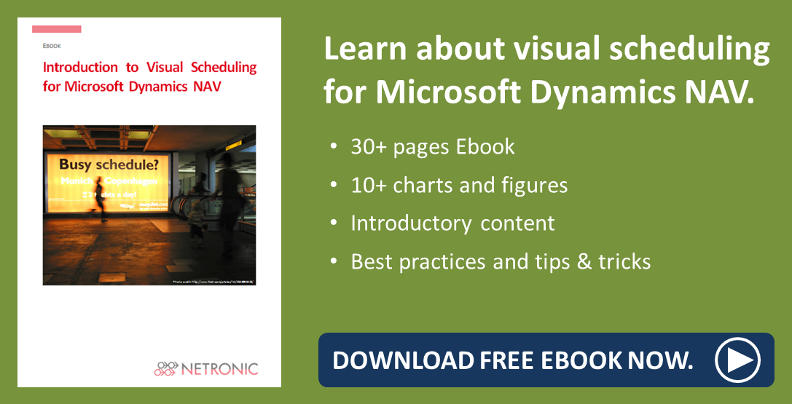 However, the standard Dynamics NAV does not indicate resource conflicts. That means that if e.g. a project engineer has already been assigned to work on a certain project, NAV does not give a warning when the same engineer gets assigned to another project at the same day. What is more, when allocating resources to tasks, NAV users cannot immediately see to which degree these resources are already planned to work on different project tasks. The value of a Gantt chart is widely appreciated among project managers. An interactive Gantt chart allows to control, manage and modify projects easily, quickly and comfortably. Since these valuable intuitive project planning capabilities are not offered by NAV, why not simply add it to your ERP system? 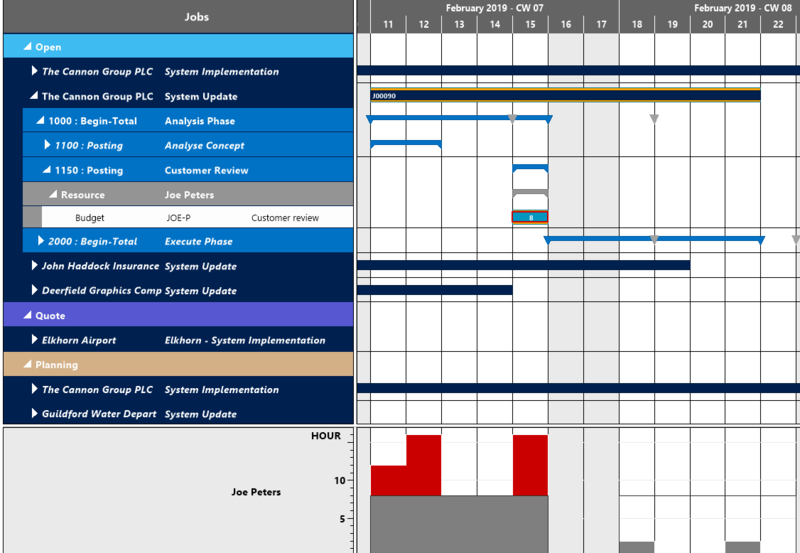 The Visual Jobs Scheduler (VJS), our fully integrated Gantt add-in, is an interactive planning table which offers the above described functionalities (and more!) that are missing in NAV and thus will bolster up your ERP system comprehensively and in no time. Since listing and describing all valuable scheduling capabilities of the VJS in depth would blast the length of this post by far, I will be brief and give you a small, however fine selection for gaining a quick and easy overview of the benefits the VJS will bring to your planning. For detailed information visit our website, follow the links in this post, or have a look at our wide-ranging documentation. Visually plan jobs, job tasks and job planning lines and resources by simple mouse actions such as drag & drop. Create links by literally painting them within the Gantt chart and thus have dependencies been taken into account for the planning. Resource allocations, including allocations caused by the Service and the Assembly module and by jobs that are not currently loaded into the VJS as well as impending conflicts or overloads are visualized in clear-cut views and by symbols and visual alerts. Keep track of the time units consumed for your project with the help of symbols and visual alerts. Keep your delivery times in check by using milestones – either on Job level or on Job Task level. With the VJS, you can assign job planning lines to a resource group and then later move them to a concrete resource, thus enabling a proper rough and fine project and resource planning within one tool. 5 comfortable and clearly-structured views (including histograms) always ensure the best perspective for every planning situation. Browse our recorded webinars to get a detailed idea about the functions of our Visual Scheduling Suite.